Designing and delivering exquisitel auditorium furniture. The auditorium Furniture available with Royal Furniturers are definitely the best investment in town. Our Auditorium Furnitures are ideal for theatres, cinema halls, conference halls, concert halls, music hall, educational institutions, schools, universities, colleges, hospitals, hotels, churches, lecture halls, amphitheaters, stadiums among many others etc. Royal Furnitures auditorium Furnitures are of premium quality and each of these is highly comfortable and durable. 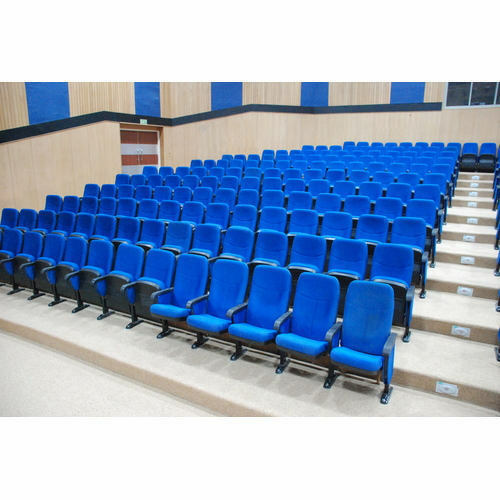 Most auditorium Furnitures available with Royal Furnitures have good quality foam that is created through high density sponge, durable shape and soft seat. Our auditorium Furnitures also have the option of auditorium chairs with cup holders and colors options such as red, grey, brown, beige, blue, camel and orange. Royal Furnitures promises reasonable prices and on time delivery. We are very worthy at customized furniture to suits your requirement and budget.